Opening today, I am so totally excited to be included in a new exhibition at the Woodward Gallery!!! 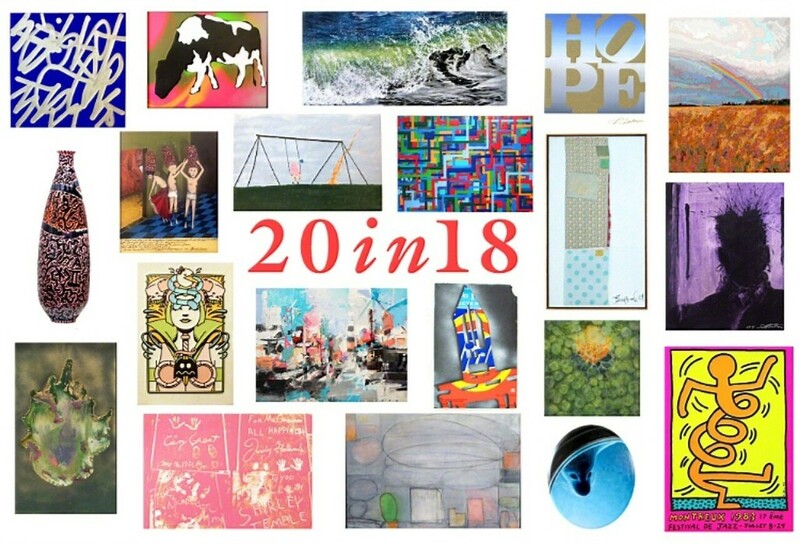 Their new exhibition, 20in18, features 20 artists kicking off their winter season. The show will run February 8th to March 23rd, 2018. My piece, “Amplified”, which is 14″x 30″x 2″, is among an amazing group of artists. Royce Bannon, Rick Begneaud, Susan Breen, Thomas Buildmore, Deborah Claxton, BK Foxx, Richard Hambleton, Keith Haring, Robert Indiana, Val Kilmer, LA2, Mark Mastroianni, Moody Mutz, JM Rizzi, Brad Robson, Jess Hurley Scott, Matt Siren, stikman, Jo Ellen Van Ouwerkerk and Andy Warhol. The Woodward Gallery is located in the Lower East Side of Manhattan. However, they have amazing exhibition windows that are always visible, I can’t wait till I can get down to the city to see it myself!! Had so much fun at the Opening Reception for, “Eyes Wide Open”, at the Cambridge School of Weston. There was such a festive vibe and got to spend time with some very talented female artists from the National Association of Women Artists. My piece, “Caught Inside”, is 29x44x2″ acrylic on multiple panels of acrylic. It was a scene, I came with my posse of little ladies, their daddy and the infamous Uncle Paddy Cakes in town from Montana. Thanks everyone for making it out! The exhibition runs through March 2nd! Whew, what a whirlwind of a December! Between openings and auctions, commissions and holiday gifts, I have been a little winded. It has taken me a a couple of weeks to pull my bits and pieces back together! 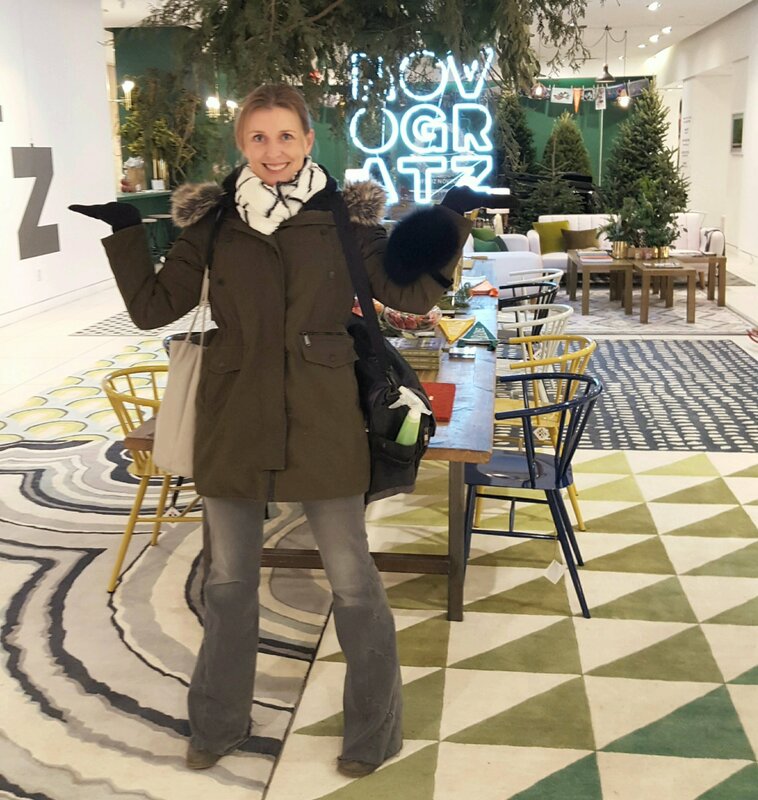 Now that I’m slightly less disorganized (for the moment) I wanted to share one of the highlights of the season, my invitation to work with the Novogratz as part of their Holiday Pop-Up Shop! 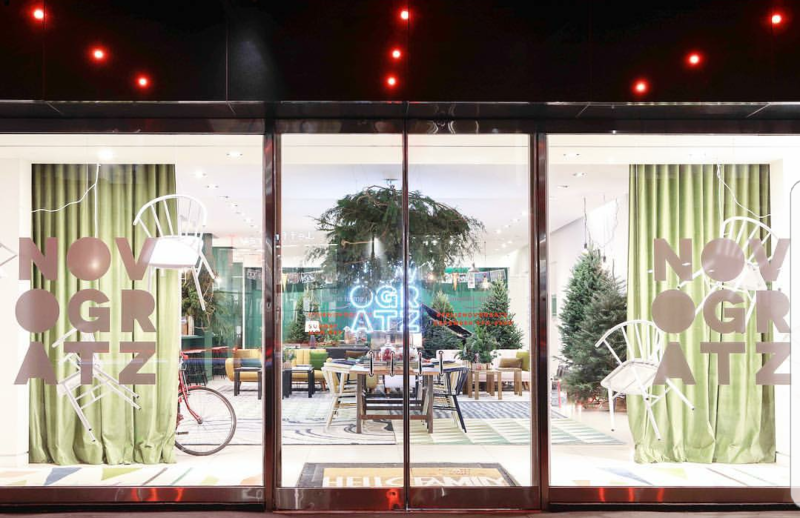 On Thursday, December 14th, I was lucky enough to be part of their month long celebration of design, art, music and good cheer! I spent the day in the shop on 14th Street live painting one-of-a-kind ornaments using my acrylic techniques. A few lucky people were able to take one home, FOR FREE, courtesy of the lovely and generous Novogratz. I also had a larger piece of my work on display and was able to talk art, holidays, and generally just hang in a gorgeous space with cool people for the day! There were musicians on hand with jazzy-seasonal songs, time to hang with Robert Novogratz and Kristine Woodward of the Woodward Gallery as well as all the other staff and visitors! It really was such an awesome experience and feel so lucky to have been a part of it! As it turns out, the Woodward Gallery has held onto the piece I brought down, “Amplified” to be part of their upcoming, so stay tuned to hear more about that! So grateful to be a small part of this amazing project, many thanks to the Woodward Gallery for the recommendation, to Robert for spending so much of his day with me, you are so kind and real, and to all the friends, family and visitors who came out! For more on the day and the other artists featured, see the Woodward Gallery’s site, and the Novogratz’ blog, Cheers! Jingle HEYYY!! The Holiday’s are here!!!? Looking forward to being part of a Hingham original, The St. John’s Holiday Boutique. I’ll be joined by some of my favorite creative people including Falk Jewelry Designs, Emma Ferioli, KJeld Mahoney Photography and Bridier Baubles. It’s my first time at the Boutique so I’m excited to bring my paintings and new pendant pieces to a whole new audience. My new collection of Pendant Paintings will be available at the show! I’ll be bringing a few medium sized and more smaller sized paintings for holiday gift giving, but will have a stock list of more available or see my “Paintings” page. For more information on the St. John’s Boutique itselve, see their site. The hours on Saturday, November 18th, are from 9am – 4pm. There will be a cafe, Santa, and 2 floors of local business to explore, with a benefit the the parish. If you are in the area, stop by to say hey, and maybe kick off your holiday shopping! ….Secret Locations to be Announced on the Tour! for a cocktail reception in the RSM Art Gallery. Thursday, June 8, 2017 | 5:30–7:30 p.m.
Twenty percent of sales will be donated to the RSM Boston Foundation. Reception: Thursday, June 8th, 2017, 5:30–7:30 p.m. CLICK HERE TO REGISTER FOR RECEPTION! RSVP: Nicole Appet at Nicole.Appet@rsmus.com or +1 617 241 2335 with any questions. SIRENS is a group show featuring three female artists. The artists, all local, are exhibiting artwork that focuses on the sea, the life systems within it and its dynamic coast line. Each artist is exhibiting a different medium: Gretchen Greene sculpts with steel and bronze, Michele Lauriat creates mixed media paintings on paper, and Jess Hurley Scott paints on multi-layered Plexiglas. The thematic yet diverse exhibition will portray the beauty, chaos and life-force of the ocean. Gretchen Greene “paints with heat,” and “carves with lightning”; she sculpts bronze and steel intuitively with a plasma cutter, die grinder, angle grinder and TIG welder. The metal, malleable while she is working, is cut, marked and sculpted into waves, corals, and kelp evoking memories of locations and times past. Seeking the limits of her tools and materials, Greene creates large scale wall reliefs, unique furniture and small table top sculptures. A suite of small works will be on display at the RSM Art Gallery for the SIRENS exhibit. Michele Lauriat paints locations she experiences through work, vacation and in between. Her York Beach Series, on display in the SIRENS exhibition, is inspired by annual summer trips to the beautiful Maine coast. “The interaction of pattern, order, design, chaos, and the push of organic systems, direct [her] attention and mark making.” Lauriat captures moments of interest with onsite sketches and photography which she explores further in the studio by enlarging, abstracting and combining the scenes. The results are dynamic mixed media watercolors full of gesture, pattern and color. This is the second exhibition of Michele Lauriat’s artwork at the RSM Art Gallery. Her works are also in the firm’s collection. Jess Hurley Scott is a contemporary seascape painter. Scott’s process begins with a wetsuit and camera; she captures waves first hand in sun and storm, warmth and winter. Her dimensional paintings consist of layers of individually painted acrylic panels and deal with light, illusion, and perception. Scott plays with the intricacies of the natural world, digital technology, and translucency in her work. The result is bold realism and a unique interpretation of seascape in “paint and pane.” Her scale ranges from near miniature scale vignettes to dramatic, sweeping seascapes. A range of sizes will be on display at the RSM Art Gallery. Founded in 2002, the RSM Art Gallery focuses on thematic group exhibitions of local artists. Quarterly exhibitions are curated by Christina Godfrey of Sunne Savage Gallery. For each exhibition, RSM Art Gallery partners with a non-profit organization who receives 20% of sales during the exhibition. 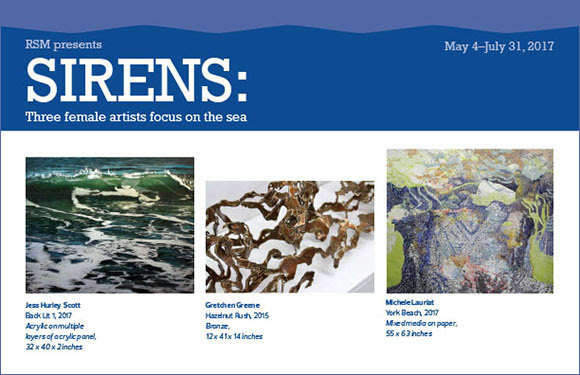 Proceeds from the SIRENS exhibition will be donated to the RSM Boston Foundation.